Yesterday I had the great pleasure of working with NYC-based filmmaker, Allan Piper. We spent the afternoon together, filming the NYC-portion of the upcoming documentary, Return to Hālawa: The Life & Music of ‘Anakala Pilipo. 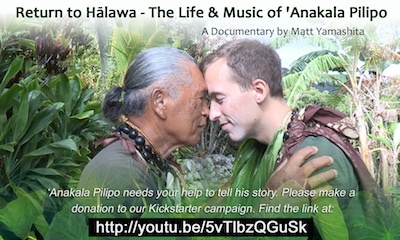 It started back in November of last year when I was on Molokai to record the soundtrack for the film. Matt Yamashita, the fearless filmmaker of the documentary, said that he wanted an NYC portion of the film. My first reaction: You’re crazy, dude. I don’t know the first thing about filmmaking. And I even imagine how you go about setting up something like that in New York City. No way. Thankfully, Matt is patient and persistent. He explained that it would be awesome to show that the things Pops has shared with me are traveling beyond Molokai’s shores, that I’m truly carrying them out into the world and sharing and teaching. He asked about the possibility of filming me teaching in NYC public schools. Again, I said NO WAY as the schools don’t let us bring cameras into the classroom because the kids are minors. And then he had a great idea: I could do a talk-story/presentation, just like Pops and I do on Molokai. Nothing major–small and intimate. And it would be great if I could get keiki/kids there, too. The whole thing could be filmed. 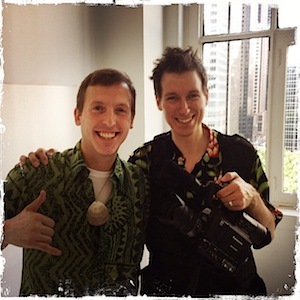 And… in an ideal world, moments that were filmed on Molokai (like me getting ready in the morning, packing up to go to the presentation, traveling to the venue, etc) would be filmed in the Big Apple–highlighting the differences in my two very different worlds, NewYork City and Hālawa Valley. I still thought he was crazy. But it was definitely worth a shot. Allan showed up at my apartment and we were able to recreate a lot of the shots that I remember from Molokai–even a scene where I’m brushing my teeth! I’m not sure either scene will make it into the final cut of the film, but I thought it would please Matt to see things come full-circle. This is how it happened on Molokai/this is how it happened in New York City. And then at the venue… WOW! A beautiful space in midtown Mahattan (lovingly gifted to us for the afternoon by one of the Crooner team, the fantastic Mariko Gordon!) with windows that looked out at skyscrapers and a park. The room filled up quickly with (count ‘em!) 18 people–including 6 young folks! Amazing! I mean absolutely amazing! And the icing on the cake: we had beautiful blue, sun-filled skies yesterday here in NYC. Talk about a blessing! The audience was a ton of fun to work with. They were the real stars of the day. I shared stories about some of the animals we have down in the valley because that always seems to make folks’ jaws drop. Yes, we have cats and dogs and birds in the valley, but we also have wild boars, goats and lizards. (And sometimes you might find a lizard in the toilet–but that’s another story…) I even shared one of the songs with motions, a short hula noho (school kid-kine) that I’d written. An epic audience participation moment! Time flew by and before I knew it, we needed to wrap up and head home. I’m still in shock that it all came together, all of those moving parts. I can’t wait to see how it fits into the final film. 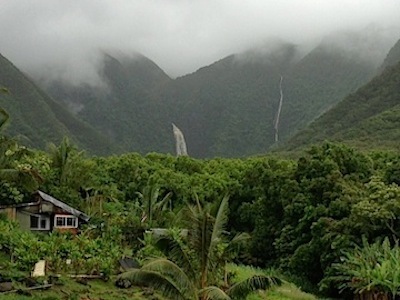 Aloha from beautiful Hālawa Valley on the island of Molokai! Iʻm on the beautiful island of Molokai at the moment, basking in the warm Aloha and natural beauty that surrounds us. It’s been an amazing 10 days. Most of the time has been spent down in Hālawa with Mom and Pops and the ʻohana. We don’t have telephone service or internet down in the valley, so communication has been limited. I’ve been posting pics on Facebook when we come out the valley for supplies or to check messages. We had some HUGE rains the other night. Folks are saying it’s all part of a tropical storm system in the vicinity. And huge rains means HUGE WATERFALLS! Auē! I’ve never seen them so big! Like a scene from a movie. Absolutely stunning. The picture above is so that you can see it–and imagine that you’re right there with us. Amazing. One of the highlights of the trip, for sure, was participating in a talk-story/kanikapila at Kālele Books and Divine Expressions in Kaunakakai the other night. Teri Waros owns the only bookstore in town–and she has the most beautiful backyard, too! A perfect spot for a get together. Here’s the cool sign that Teri Waros had posted all over town about the talk-story session with the kūpuna at Kālele Books and Divine Expressions. Talk-story sessions/kanikapila jam sessions are always fun, but this one was even MORE SPECIAL because of all the kūpuna, the island’s elders, that attended. I came into the space and saw their faces–like seeing a Hawaiian royal court. So wise. So kind. So much Aloha. It was such a gift to be in their presence for a while. To share a song (and a hula!) or two. And then to just surround myself in their mana–their presence–so full of Aloha. A giant MAHALO to Teri Waros and all who came out to make the night so special. I’ll be posting more stories and pics soon. I should have regular internet service once I get to Oʻahu on Tuesday. Wait! What’s that? Did I just say I was heading to Oʻahu? And it’s for a good reason, too. I’m so excited to be returning to the stage of Pakele Live next Thursday. I’ll send the details out tomorrow–so stay tuned! And it’s a concert YOU can see, too–over the internet! Right on! I’ll be posting details tomorrow. May you all have an awesome Aloha Sunday. And please share some Aloha–the world needs all that we can give! It’s good to be back in NYC for a few days. I had a great time in Chicago last weekend with Kumu June Kaililani Tanoue and her students at Hālau i Ka Pono. When I arrived on Friday, I was greeted by the smell of plumeria—and they were from Molokai Plumerias, a smell/taste of “home!” Some of the dancers had gotten together earlier in the afternoon to string some beautiful lei. Wow. What a welcome! That sure was nicer than the smell of the airport! Afterwards, I watched an ipu making/decorating workshop. So amazing to see what one can do with a gourd. Next time I’ll be a participant, for sure. I’ll need to remember to save space in my carry-on bag for the gourd to come home to NYC with me. I was scheduled to give a talk-story/performance on Saturday night. But before we went to the Zen Life & Meditation Center (the fantastic venue where the event took place), we stopped off at a house party to give a short performance. It’s a treat to share Aloha! The evening was also blessed by some beautiful hulas, danced by the lovely ladies of Hālau i Ka Pono. What an honor to have them bring the songs to life through their dancing! And if that wasn’t enough Aloha and hula for one weekend—we did ANOTHER show at the Millennium Park Family Fun Festival on Sunday afternoon! It was a thrill to be a part of it. The dancers rocked the event and the audience loved it. (And it was great to be sharing the stage with Bob Althouse on mandolin. ‘Ukulele, mandolin and Hawaiian music make a happy trio, for sure!) We ended the afternoon with some lunch and sightseeing. I love being a tourist! It was an awesome and jam-packed weekend. I’m always so grateful for the opportunity to share the spirit of Aloha—as well as stories and songs from Molokai and Hālawa Valley. It’s an honor. 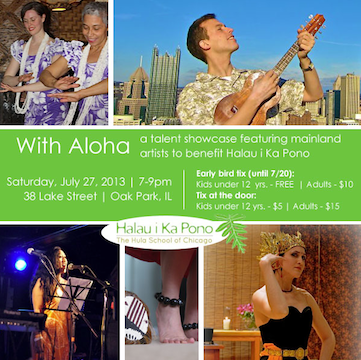 A weekend of Hawaiian culture in CHICAGO! I’m packing up the suitcase, again. 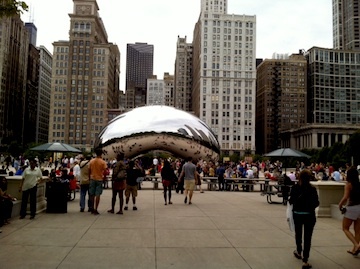 I’m heading to Chicago for a weekend of Hawaiian cultural activities! Yup! Hawaiʻi Island-born kumu hula, June Kaililani Tanoue has a hālau hula (hula school) out in Oak Park–Hālau i Ka Pono! 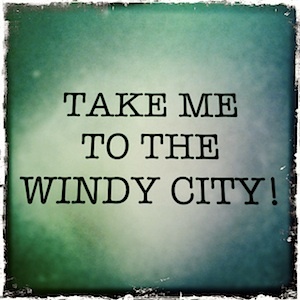 And they’ve invited me to join them for a jam-packed weekend of hula classes, an ipu making/decorating workshop and a performance at Chicago’s Millennium Park! And I’ll be giving a talk-story/performance on Saturday night! My first talk-story since the most recent Molokai trip. 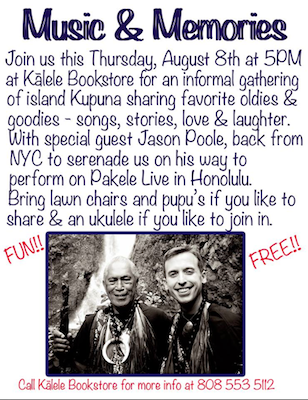 I’m excited to share stories and songs–and I think the hālau is going to grace the evening with some hula, too! If you’re in the Chicago area, I hope to see you at any/all of the weekend’s events! Now… where did I put my ‘ukulele tuner?